The Wall Street Journal reports VIX Just Finished Its Calmest Quarter Ever. Market volatility is nowhere in sight as the final stretch of 2017 kicks off. The CBOE Volatility Index, or VIX, just finished its calmest quarter in history, averaging just 10.94 over the past three months. The gauge has fallen for three consecutive quarters, its longest streak of declines since 2011, according to the Journal’s Market Data Group. The VIX uses options prices on the S&P 500 index to produce a measure of expected stock swings over the next month. It tends to fall when stocks are rising, and vice versa. But the absence of volatility hasn’t tapered volatility trading itself. Even as the gauge capped off its quietest quarter ever last week, one trader pushed through one of the biggest VIX bets in history, and drove the total number of VIX options traded to a new daily high of over 2.6 million contracts. The record trade could cash in if futures contracts on VIX crossed the 20 threshold come December–a level the index itself hasn’t crossed all year–but lose money if it rose too much higher, analysts said. 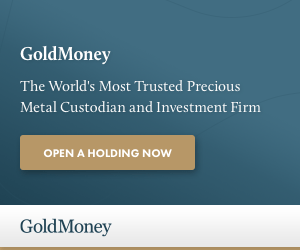 The wager extended a trade initially made for October, and entailed selling bearish put option contracts with a 12 strike, buying bullish call options with a 15 strike while selling call options with a 25 strike. All of the contracts expire in December. But others don’t see the calm ending. Volatility has fallen so low this year that the Chicago Board Options Exchange has had to introduce new, lower strike prices–or the level at which contracts can be executed. 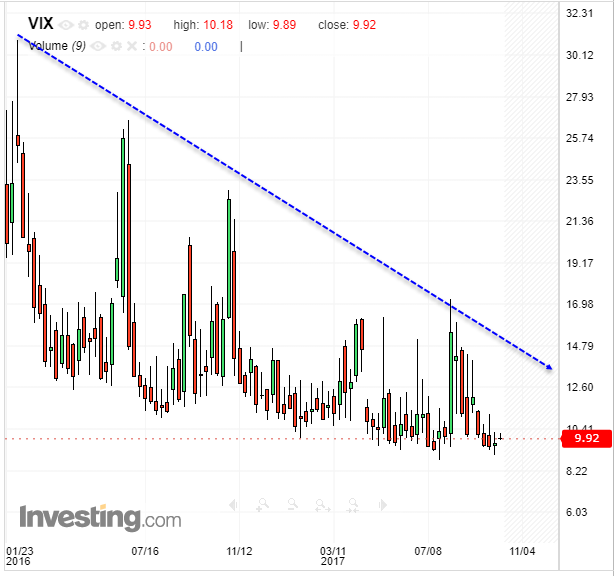 Investors can now wager that the VIX could sink as low as 9. The WSJ did not say who the trader is but it appears to be billionaire bond guru Jeffery Gundlach. 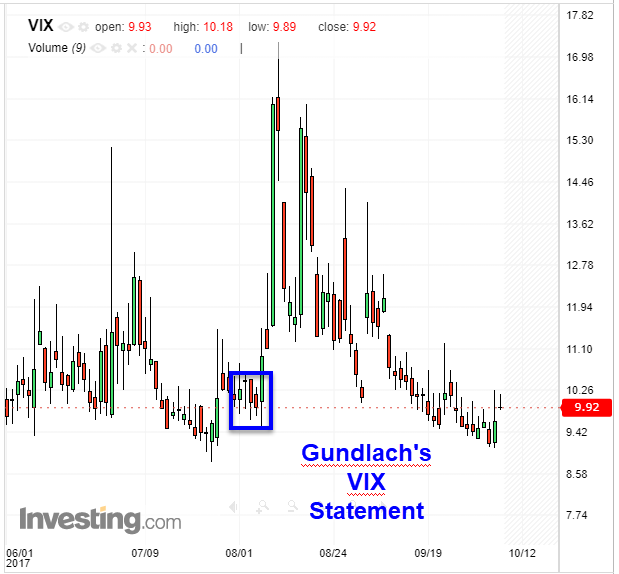 “I think going long the VIX is really sort of free money at a 9.80 VIX,” said Gundlach. Gundlach expected to make 400% on his bet. Immediately following his statement the VIX spiked and I suspect VIX calls doubles in value, but are now underwater. Whoever the WSJ was talking about has now upped the ante and in a way that can lose if the VIX does not get to 20 or if it gets too high. We keep trying to make sense out of a system controlled by skynet and digital zeros. Immediate chaos or chaos at some unknown point in the future, on purpose or flying apart on its own, choose your poison. Skynet is a fictional neural net-based conscious group mind and artificial general intelligence (see also superintelligence) system that features centrally in the Terminator franchise and serves as the franchise’s main antagonist. AT &T Cable TV & Internet, customer service is screened by AI. AT&T is the most disliked customer service. This is not Sci Fi. The SPX and Dow Industrials a have VERY distorted Elliott waves. I’ve never seen so many zig-zags that don’t overlap to form a triangle or ending diagonal. My spectral analysis software is showing the market being supported by cycles of shorter duration and increasing amplitude. This is similar to what happens to a signal approaching a discontinuity using Fourier Series. In financial markets. “discontinuity” means crash. And the Fear-Greed chart has recently made a 3 year high at the 95% level. This is definitely an extreme reading. I remember the Fed bragging that they had eliminated the business cycle, and the economy had entered a “new normal”… that was right before the $#^( hit the fan and the financial system imploded. The Fed had no idea the collapse was coming, and was powerless to stop it. There is no question the Fed under Bernanke and Yellen has manipulated financial markets to obscene levels. But financial markets are intermediaries (that is even what the Fed calls banks — financial intermediaries). The Fed’s policies have not helped, and in many cases have hurt, Main Street USA… the entities for whom Wall Street intermediates. Main street is what makes the country go around, the banks take a fee for intermediating. Since the Fed hasn’t lowered volatility on Main Street (actually made it worse, alongside strong anti-business policies of Obama regime) — volatility has **NOT** declined. If anything, business uncertainty is much higher than it was when bumbling Bernanke stumbled out of academia. Yield starved speculators are selling vol because they THINK it is free revenue. But anyone with more than a few years trading experience knows that selling gamma is just picking up nickles in front of a steam rolller. Day is approaching in Korea, we will likely see a missile launch and Trumps calm before the storm response. Bigly time volatility likely. Mish looks like you have a few cranky people here tonight, hot dogs with their fancy software and charts upset the the market hasn’t crashed yet like it was supposed to do way before now, without a doubt the most hated bull market in history. I am aware that bull markets are supposed to end with fireworks, extreme volatility that certainly hasn’t happened yet. Could this time be different? 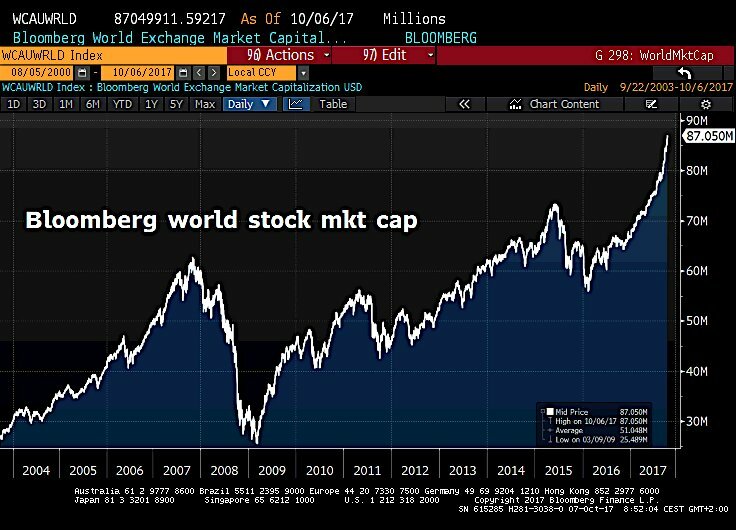 Probably not since this bull has probably the weakest fundamentals ever with all the debt at every level, stock buybacks, weak growth, geopolitical concerns so what will be the catalyst? I wonder with the country becoming sadly more and more divided, if some kind of extreme political event might precipitate a crash? This begs the question… Can the central banksters, acting in concert, hold it together for ever? What happens one day when they find they are not Atlas? They just print as much as they like and buy the whole market. The VIX should be at zero. To infinity and beyond! Very much possible. These jackasses are capable of anything till it is pitchfork time! Central Banks around the world are buying stock with fiat money. Japan’s central bank owns over 70% of the major market ETFs to cite just one example. 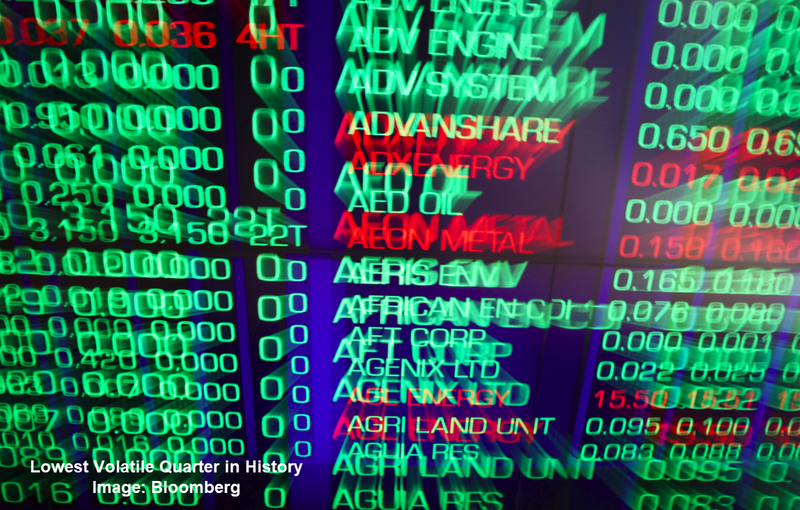 Sovereign wealth funds are buying stocks with money borrowed at zero interest. The reason volatility is being crushed because everyone is waking up to the realization that none of these holders will ever sell their holdings. They will only buy more at any sign of a dip. Central Banks stand ready to flood the markets with money at the first sign of any turbulence and that includes a Korean War. 1.) Such a strategy was tried by major US banks in the early stages of the 1929 stock market crash. The markets still fell. If a strategy couldn’t work at as national level, it won’t work at the global level. 2.) Elliott Wave International clearly demonstrated major central banks adjust policy and rates based on what the market does. This happens over 90% of the time. The data is there if investors really wanted to see. The stock market has reached a permanent plateau. Real countries with a lot more citizens than the U.S. are sick to death of the unlimited credit card that the U.S. dollar gives to the insane U.S. foreign policy. Things continuing as they are indefinitely would require all those other countries to keep putting up with it. This seems extremely unlikely. Yet they complain and continue to put up with it. You are correct that our foreign policy has been a disaster for decades. But how do you think European countries would react if we vastly reduced our funding to NATO or reduced our military presence in Japan or South Korea? Can we now classify the VIX with the CPI along with a bunch of other alphabets as propaganda? $VIX is doing it’s final test and will command a high salary in the market. The first interview with Mr. Market started yesterday at 2 PM. Check VXX, 1 min chart, from 2 PM 10/09/2017 ==> VXX popup. Somebody accumulated a lot of VXX shares, in the last month, fooling everybody. let go. He knows what is coming next. VXX is not dead. It’s alive, very healthy and rejuvenating. In a world of cycles, there is no forever.